Skirts: Uniform skirts with hemlines not more than 3 inches from the top of the knee. Any alternation that damages the skirt will require that a new skirt be purchased. Shirts: Only uniform (white or gray) shirts may be worn. A white uniform shirt must be worn for all school photos and specific assemblies. Sweater: For grades 9, 10 and 11, the uniform sweater in navy blue may be worn in class. 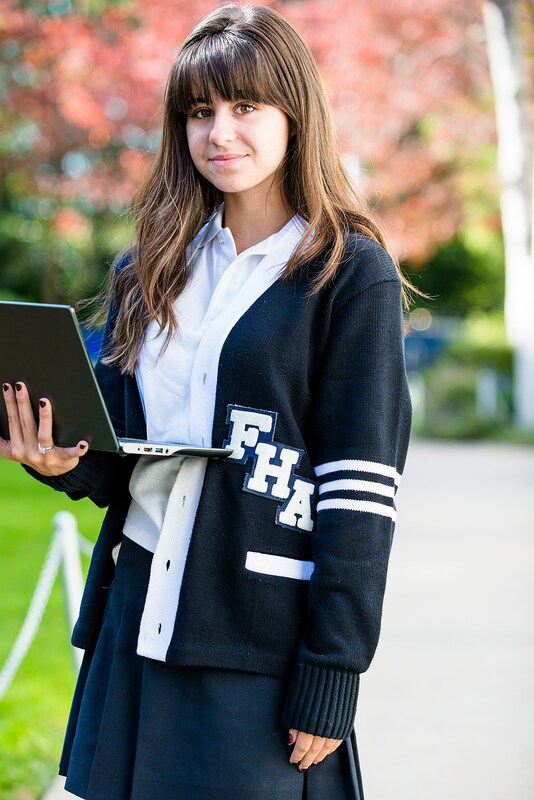 For grade 12, the navy blue school sweater or the senior sweater may be worn in class. No fleece, sweatshirts or hoodies may be worn at any time with our formal uniform. Shoes: White Cross shoe #3305G, Dr. Martens #1461 or TOMS Black on Black Slip ons. Stockings/Socks: Only opaque stockings in solid colors navy, dark gray, or black may be worn. White socks that cover the ankle must be worn with slacks and only with the skirt when the weather dictates and an announcement is made. Socks may not be worn over opaque stockings. Outerwear: Outerwear should be appropriate, clean and well-tailored. Winter coats or jackets are the only types of clothing that should be worn to and from school. Coats/jackets may be worn between buildings but not in class or in the cafeteria during lunch periods. Scarves: Gray or uniform FHA scarves may be worn. Physical Education: The school physical education uniform must be worn and for safety reasons, no jewelry is allowed. Hair: Style, color and accessories must be in keeping with business-like attire. Non-natural occurring hair colors are not allowed. Jewelry: Earrings must be appropriate. No large hoop or chandelier earrings are allowed. Piercings: No visible and/or external piercings may be worn in school. This includes nose, tongue, lip, brow or any facial piercings. Earrings worn in the earlobe should be small in size so as to promote personal and public safety. Off Campus: Any student who participates in an off-campus school-sponsored activity is expected to dress appropriately. Any apparel that is deemed unacceptable by the administration, may result in the student’s forfeiting the privilege of participating in such activity. No Skirt List: If after 2 warnings, a student’s skirt is deemed too short, she will be required to wear uniform slacks for the remainder of the school year. *** Any student who borrows a uniform part (shoes, skirt, shirt) must make a donation to Lifestream. Shirt and skirt must be laundered before returning. Stockings/socks must be purchased.